Mr. Guillet is a familiar figure in the field of Canadian local and social history: his work has been acclaimed for its thorough and accurate research, its skilful use of source material, its wealth of authenticated anecdote, and its attention to detail. Written in an attractive and comfortable style, and illustrated with photographs often contemporary and previously unpublished, his books are a f… und of information about areas which too frequently are neglected in Canadian historical writing.Pioneer Arts and Crafts, first published in 1940 and later expanded as a section of The Pioneer Farmer and Backwoodsman (University of Toronto Press), is typical of Mr. Guillet's fine work. 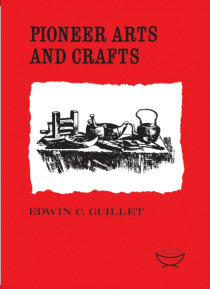 In this book he describes all aspects of domestic manufactures and processes of pioneer days: he traces the development of wood-working in furniture and buildings, and of the tanning, spinning and weaving industries. He describes many farming activities which have long since disappeared, for example soap-making and lime-burning. There are several chapters on cooking and various food processes and recipes which include preparation of drugs and medicinal remedies, substitutes for tea and coffee, and the making of lard and sausages. Throughout this account there are quotations from contemporary journals, and anecdotes about various personalities in those early times, which bring our pioneering past to life again.Recommended for use in Ontario schools by the Minister of Education, this book is for all ages, for everyone interested in Canada's pioneering heritage.